Cairns is well represented by the four education sectors, with two Universities, TAFE and private Vocational Education and Training (VET) providers, English Language Colleges, public and private schools all offering study options to international students. 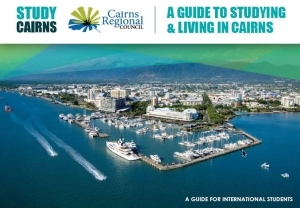 An advantage for international education students in Cairns are the established Education Pathways between each education sector enabling international students to undertake study in more than one education sector. Students can begin their studies in Cairns through a short Study Tour, at school or at an English Language College. Further opportunities along the Education Pathway can continue with long-term study at a Vocational Education and Training College or at University. Cairns offers some of Australia’s most unique international education and training opportunities. It is a global centre for tropical health, science and marine biology. It hosts regional campuses of two world-class universities, James Cook University and Central Queensland University, in addition to a wide variety of government and private training providers and English language teaching professionals and schools. Cairns is a great place to study. It is easily accessible, affordable, and provides a safe place to live and learn in a cosmopolitan multicultural society. International students offer a raft of social, cultural and strategic benefits to the Cairns community through increased cultural awareness and diversity. The welcome diversity that international students bring to Cairns is embraced by the community. Visit Study Cairns for a comprehensive overview of study options in Cairns across all education sectors.